The actual date actually slipped past me; my 6 year date was on October 19th. I knew it was sometime this month, but I’ve just been too busy to stop & look it up! Then today, I received this lovely card in the mail. I love figuring out what products were used in making cards! I put on my detective cap, pulled out my catalogue, and figured it out! The flower was die cut with the Big Shot and Sunshine Wishes Thinlits. The sentiment was stamped onto a banner die cut with the Bunch of Banners Framelits. I love how they used the Patterns Party Decorative Mask to stencil the pattern in Island Indigo ink. The combination of Whisper White with Island Indigo and Soft Sky cardstock is just beautiful! And blues are my favourite colours 🙂 And isn’t that Island Indigo 1/4″ Ombre Ribbon pretty?! Here’s a look at the inside; you can see that it was sent from our Canadian office in Calgary, Alberta. It’s signed by Dale Hampshire, who is the manager there. 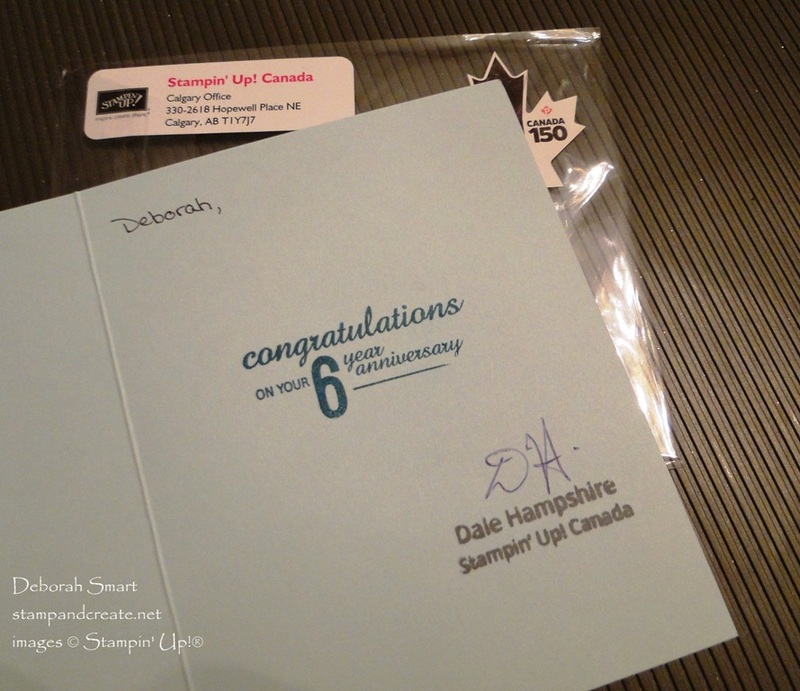 If you’d like to start your journey as a Stampin’ Up! demonstrator, there’s no time like now! 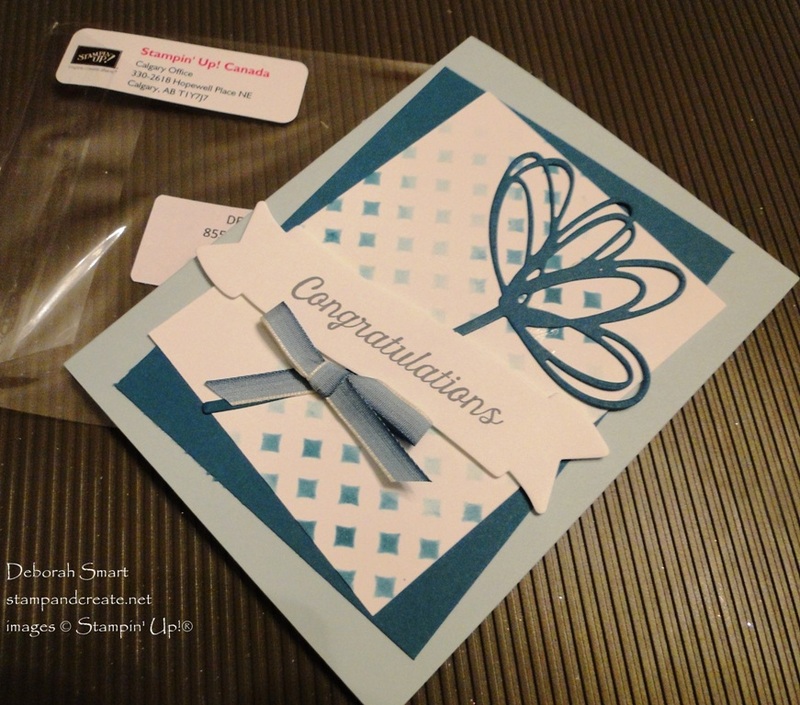 With the amazing Starter Kit, the support from Stampin’ Up! as well as from me and my Team – you’ll learn a lot, have lots of fun, and make loads of new friends! For more information on joining, you can check out THIS PAGE, or contact me at debsmart@shaw.ca, and I’ll answer your questions. I’d love to congratulate YOU on the start of your great journey! Previous Previous post: Another Coffee Card! Next Next post: Merry Cafe Free Tutorial! That is so nice that they recognize your years as a demonstrator. In 7 years I have never received a card of thanks for my service. Thank goodness I like what I do here e in USA. That’s when you know your appreciated. Happy anniversary! I am so glad we both became Demonstrators because it allowed us to meet! You must be pretty special to get a card from SU (but then again, I already know you are special! ).